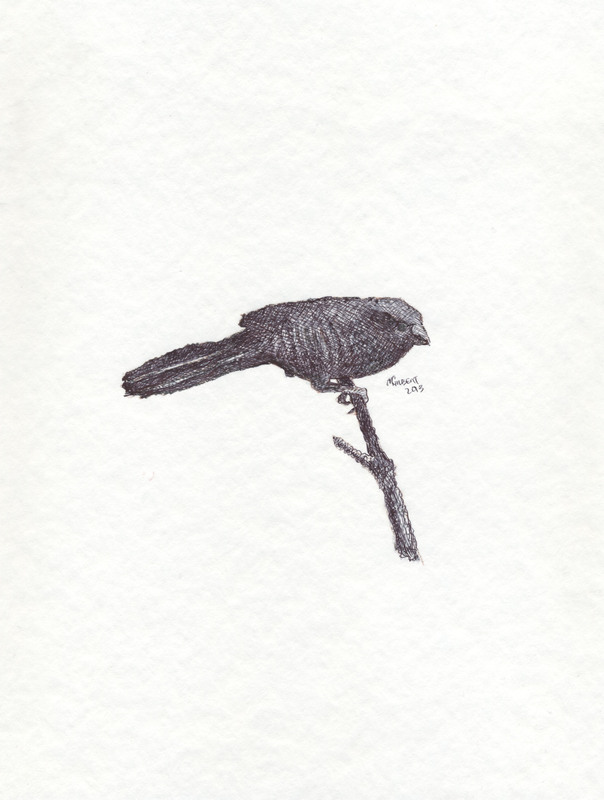 As I have written earlier, I began a new series of bird drawings based on images of actual birds taken from nature. However, just as the case for the imaginary birds that I draw, I am always mindful are the direct descendants of dinosaurs. And so, my goal is never to portray them with the accuracy of a biologist’s drawing or to make them anthropomorphically pretty. I want them to look like dinosaurs. If birds were suddenly return to their former dinosaur size, I would not want to meet one. They are cold, merciless and efficient hunters and their intent is to survive. It is easy to see that when it comes to eagles, hawks and other raptors. But, it is true for all birds. I have tried to convey that when I draw them. This one, for instance, is of a very common songbird but a dinosaur descendant notwithstanding. All drawings in this series are 8 x 10 inches and in pen and ink on acid-free, mold-made paper. This entry was posted in Uncategorized and tagged birds, dinosaur, drawing, figurative, nature, pen and ink. Bookmark the permalink.